Chipotle investors must be feeling queasy. Shares of the once super popular Mexican food chain are in free fall again, even though Chipotle reported decent sales and earnings last month. Chipotle (CMG) stock is down nearly 20% so far this year, and hit its lowest level since February 2013 on Tuesday. Chipotle may have finally recovered from the E. coli nightmare it endured a few years ago. Sixty consumers in 14 states got sick following an outbreak back in 2015. The Centers for Disease Control and Prevention declared the outbreak over in early 2016. But in the past few weeks, Chipotle was forced to close a location in Dallas where rodents were sighted and the company also had to deal with a norovirus outbreak in a Virginia restaurant that was the result of a sick employee. That's spooked Wall Street. 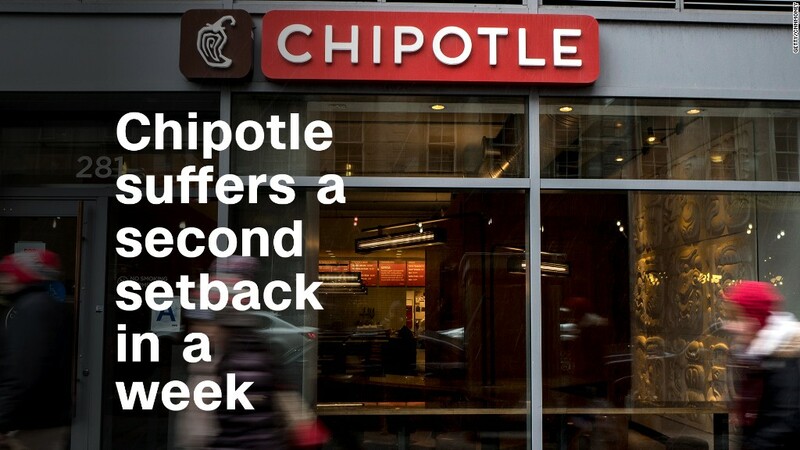 It's reasonable to wonder what Chipotle can do to get back on track. Adding queso to the menu permanently and ditching chorizo -- which is the latest Chipotle rumor -- might not be the answer. It's clear Chipotle has to do something to attract more customers and investors. Chipotle is struggling while other restaurant chains are thriving. Shares of former Chipotle investor McDonald's (MCD) are up more than 30% this year. So are shares of Burger King and Popeyes Louisiana Kitchen owner Restaurant Brands (QSR). And shares of Taco Bell and KFC parent company Yum! Brands (YUM) have soared more than 20% as well. If Chipotle's stock continues to slide, it's possible that takeover talk -- or at the very least, chatter about the company going private -- could start to surface. After all, the restaurant industry is rapidly consolidating. Restaurant Brands just bought Popeyes earlier this year. Olive Garden parent Darden (DRI) acquired Cheddar's Scratch Kitchen in March. And Panera, the sandwich chain that often gets mentioned alongside Chipotle as a leader in the so-called fast casual restaurant revolution, sold out to Krispy Kreme owner JAB Holdings in April. Chris Arnold, a spokesman for Chipotle, would not comment about any sale speculation or the stock price. But Arnold did say in an email that the company is taking food safety seriously. He pointed out that the company hired Dr. James Marsden, a food safety expert, as its executive director of food safety. The company also has an outside council reviewing things like supplier relationships and restaurant safety procedures. As for chorizo and queso, Arnold said that Chipotle has eliminated the sausage and added the melted cheese in Colorado. It has kept both items on the menu in Southern California. For now, the company is still testing what to do with those items nationwide. Still, investors are losing patience. Four Wall Street analysts have a "sell" rating on Chipotle stock. Sell is typically an unheard of four-letter word on Wall Street -- one that's dirtier than a rat-infested restaurant. And one of the analysts with a sell on Chipotle, Deutsche Bank's Brett Levy, just cut his target on Chipotle to $250 -- nearly 20% lower than the current stock price.